SHERMAN OAKS, Calif., Jan. 23, 2019 /PRNewswire/ -- Black Angus Steakhouse, the original American Steakhouse, announced today the launch of a Valentine's Day inspired digital campaign and contest seeking stories of romance sparked in its restaurants. Running now through February 1, customers can submit their #FlamesofLove stories on Black Angus' social pages for a chance to win a delicious dinner for two - via a $150 gift card - at any of its 43 locations. 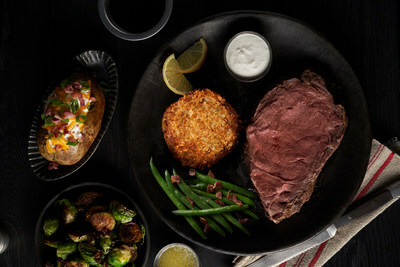 For customers searching for a little tenderness in their day of love meal, Black Angus will be offering a Prime Rib and Crab Cake promo from February 14-17, while supplies last. For just $29.99 its mainland restaurants will dish up a perfect combination of a seasoned, slow-roasted Prime Rib paired with a flavorful Crab Cake, 2 Classic Sidekicks and Sweet Molasses Bread. "Black Angus Steakhouse has set the scene for first date-nights, marriage proposals, anniversaries and more for almost 55 years," said Liz Geavaras, Chief Marketing Officer Black Angus Steakhouse. "We're always inspired by our customer's love stories and hope to keep the romance alive by reliving those moments or creating new ones at our restaurants." Black Angus fans can share their love stories for a chance to win one of 10 dinners for two, using the hashtag #FlamesofLove on Facebook or Instagram, and can follow either www.facebook.com/BlackAngusSteakhouse or www.instagram.com/BlackAngusSteakhouse for more information. Posts must be made by February 1, 2019 and winners will be notified by Friday, February 8, 2019. To make a reservation to dine-in on Valentine's Day, restaurant-goers can visit www.BlackAngus.com. Black Angus Steakhouse has been mastering its craft since it was founded in Washington in 1964. Headquartered in Los Angeles, Black Angus has 44 locations across California, Washington, Arizona, New Mexico, Alaska and Hawaii. The restaurants pay homage to its Western cattle rancher roots by offering the finest Certified Angus Beef® and USDA Choice steaks and burgers, in addition to seafood, salads, sides and desserts for the entire family. The Bulls Eye Bar serves a robust menu of craft beer, wine and hand-crafted cocktails. More information is available online at BlackAngus.com or follow Black Angus on Facebook or Twitter @BASteakhouse.